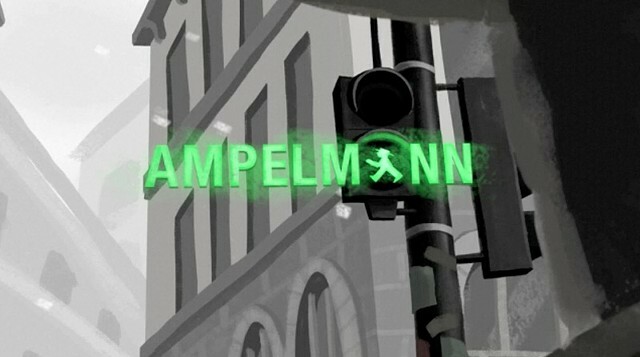 Ampelmann tells the story of an old man who spends his days repairing broken traffic signals in modern-day Berlin, yet cannot bring himself to repair the broken relationships of his once-happy family life. Estranged from his daughter and grandson for years, the repairman now sits trapped in a small, isolated world—not far removed from the static traffic signal men (Ampelmännchen) that he brings back to life on a daily basis. After failed attempts to communicate with his daughter, the dejected repairman reaches a tipping point when he encounters a traffic signal that seems beyond his ability to repair. As the repairman turns to give up, he is surprised to find that the green Ampelmann has come to life—like some celestial sprite—and is running away from his perch. The chase that ensues guides the repairman away from the troubles of his life, and ultimately delivers him the opportunity to take the first steps in reuniting with his family. Finally, with the encouragement of the Ampelmännchen that he has repaired for a lifetime, he is free to walk, to move forward with his life.